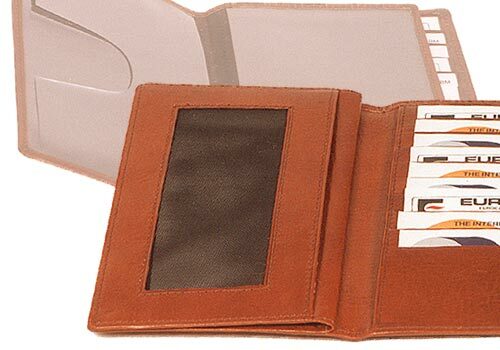 Description : This Tamponato wallet is also a diary cover. The RHS has nine slots for credit cards. The LHS has a flap with a net window for a driving license or photograph. There are two side pockets. On lifting the flap, one comes across two plastic windows on each side that would allow you to slide in both ends of your diary. The colours available are Black, Brown, and Burgundy & Blue.